Style and patriotism haven’t always gone hand in hand. Some men take the challenge too literally. Thus, a sea of guys clad in American flag blazers and USA t-shirts descend on beaches and barbecues across the country. For many, expressing pride in their country often borders on parody. But there’s a way to show your respect and still look pulled together. For your outfit to qualify as patriotic, it needs to include red, white, and blue. And it should probably feature a flag or other symbol of American history. Instead of having that symbol splashed across your chest, opt for something subtler. Our Brunswick Sport Nylon Belt is decorated with mini American flags all around. And with its aluminum slide buckle and sizing flexibility (up to size 42), it’s the perfect accent for any outfit. Instead of going over the top, work some quiet patriotic style into your look. Though you’re planning to incorporate red, white, and blue into your outfit, there’s no need for all three colors to be present in the same garment. Don’t take a “one size fits all” approach. It’s okay to piecemeal it with color blocking. Throw on a red polo, blue shorts, and white shoes. A white dress shirt, blue jeans, and red shoes. Or try a similar combination. You aren’t bound to any rules beyond which colors you can use. Don’t be afraid to get creative. If you’re a guy who prefers to avoid all the Fourth of July outfit hysterics, show your pride through your accessories. The small touches can go a long way. Perhaps it’s a braided red bracelet or white leather wallet. If you really want to show some pride without going overboard, the Navy Verona Loafer with a red outsole is the perfect option. Even if you keep your patriotism limited to one small part of your body, it still counts. When you think of American colors, you imagine red, white, and blue in their purest forms. The red is vibrant, the blue is deep and rich, and the white is, well, white. However, when it comes to fashion, you have room to experiment. Try a pastel blue, a cerulean, or a shade that’s more washed out. Trade out your standard red for burgundy or maroon. And believe it or not, there are different shades of white, too. Cream, eggshell, and ivory are just a few worth testing out. Our Navy David Oxford Saddle is the perfect embodiment of different tones of patriotic colors. The American flag colors will always be the same but that doesn’t have to be the case for the way you pay tribute. Allow your patriotism to expand to pieces that you aren’t wearing. Maybe your beach towel is blue. Or your tote bag is red. Or even the cooler with all your beer and wine has all three hues. For some guys, sticking to the three-color dress code can be limiting. Mix it up in ways that aren’t necessarily on your person but are still visible. 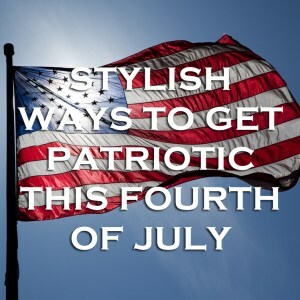 Dressing for the Fourth of July can be a stylish affair if you heed a few simple guidelines.